The Rebel Sweetheart. 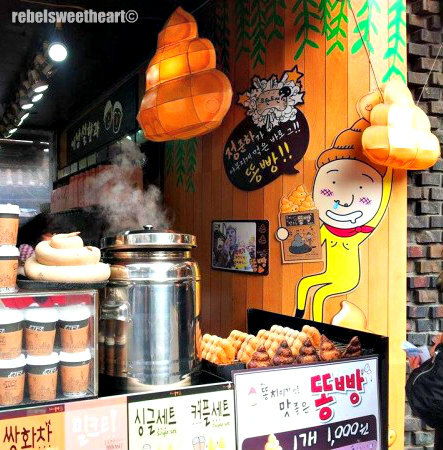 : Seoul Searching | Top 5 Must-Try Korean Snack Shops. Seoul Searching | Top 5 Must-Try Korean Snack Shops. With the exception of my husband and the huge deals and discounts on my favorite makeup and skincare brands, there is one other thing that I miss dearly about South Korea - the food. They say you'll never go hungry in Seoul, and I can very much attest to that. 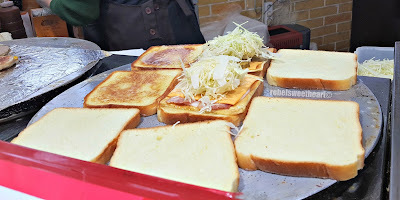 With the diverse selection of street food available in just about every nook in cranny in Seoul (particularly in tourists areas such as Myeongdong and Dongdaemun) and with affordable prices to boot, it won't be surprising if you gain a pound or two after a vacation in South Korea. In one of my previous posts, I made a run down of must-try Korean food. 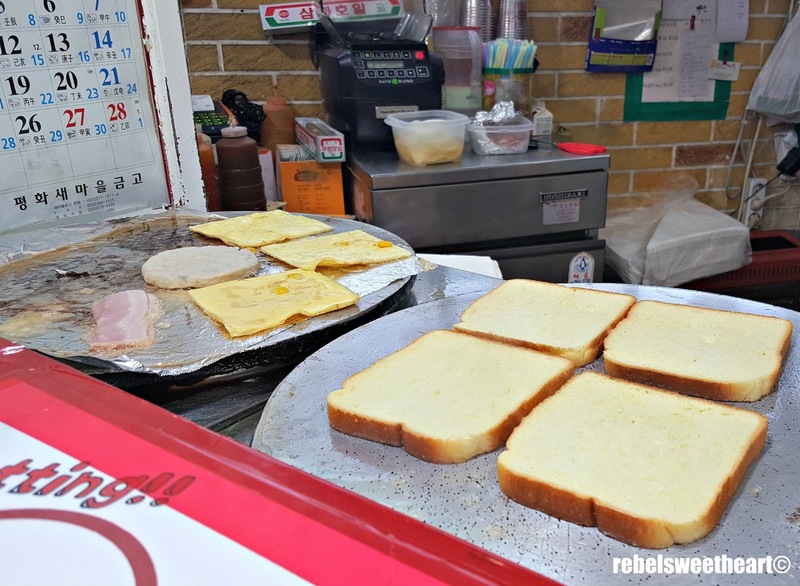 This time, I'm listing down some of the snacks shops in Korea that we have been to, tried, and enjoyed - and where to find them. Deoksugung Palace, City Hall Station, Exit 2. 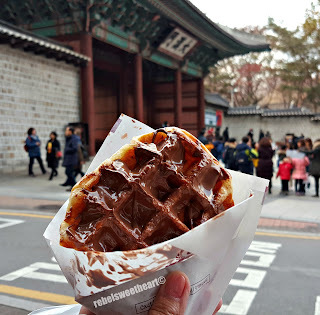 After watching the Guard Changing Ceremony and a quick stroll inside the Deoksugung Palace, Yue and I decided to grab a quick bite at the nearby stall of Limburg Waffle. Located right next to the main entrance of the palace, this hole-in-the-wall snack shop serves liege waffles with toppings, coffee, hot chocolate, and fruit smoothies. While waiting for our waffles to cook. Small as it may seem, there's almost always a queue at this snack shop - even in the dead of winter. 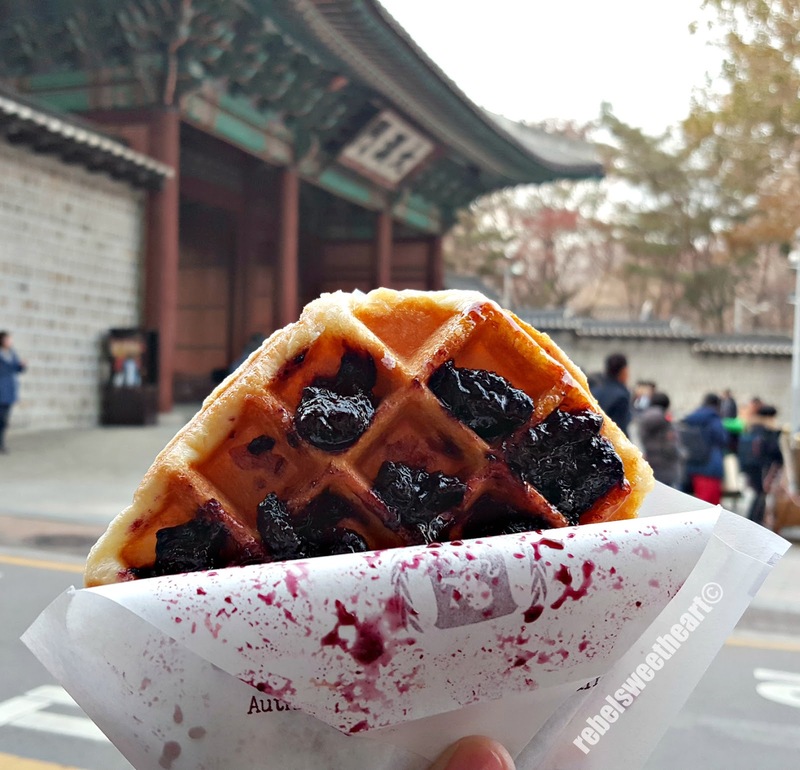 The waffles smell heavenly with the scent wafting towards the direction of the Deoksugung Palace, as if inviting tourists to drop by for a waffle or two. Their best-selling waffle, which I eventually ordered. 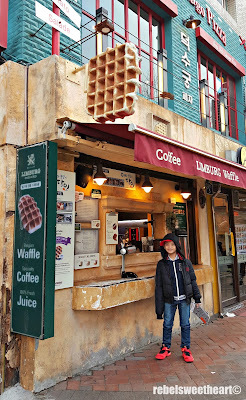 Yue ordered the Nutella Waffle (3500 won), while I got the Blueberry Spread (3500 won). Both waffles were perfect - coated with caramelized sugar on the outside with a bit of crunch on the edges, and soft, fluffy, and buttery on the inside. Hands down, the best waffle I have tried in Seoul! Myeongdong Station, near the ticket gate entrance. I love Myeongdong for so many reasons, and among them is this extremely popular Deli Manjoo stall. 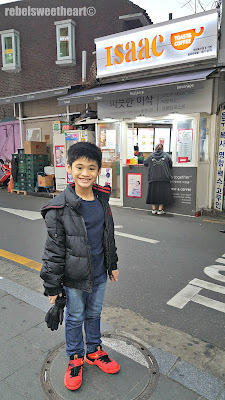 Located near the ticket gate entrance of Myeongdong Station, this stall is a tourist attraction itself as there's always a line in front of it whenever I pass by. Deli Manjoo is short for 'delicious mandu', or 'delicious dumpling' (mandu is the Korean word for 'dumpling'). They're not your typical meat/vegetable-filled dumpling, though. These bite-size corn-shaped treats are filled with sweet and creamy custard that my boys (and I) love. My boys love these just as much as I do! Freshly-baked and served piping hot, they're perfect as pasalubong, or as a snack while riding the subway. Yue would always ask for these whenever I go to Myeongdong, and he can finish a pack in just one sitting! 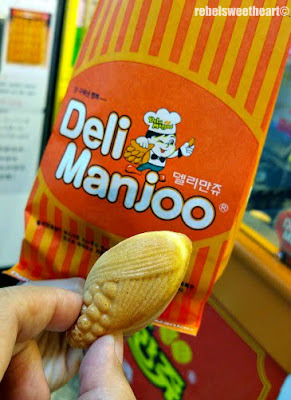 These yummy treats are usually sold by the dozen, and I would often buy the 5000 won pack which contains 24 pieces. Ssamziegil, the iconic cultural complex located in the heart of Insadong, is home to handicraft stores, accessory shops, art galleries, food stalls, and a variety of charming knick knacks. 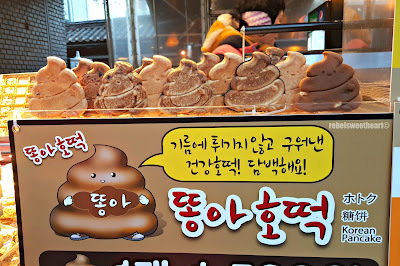 Here, we discovered this quirky stall which serves 'dong bang' - or in English, 'poop bread'. Don't be disgusted, though. 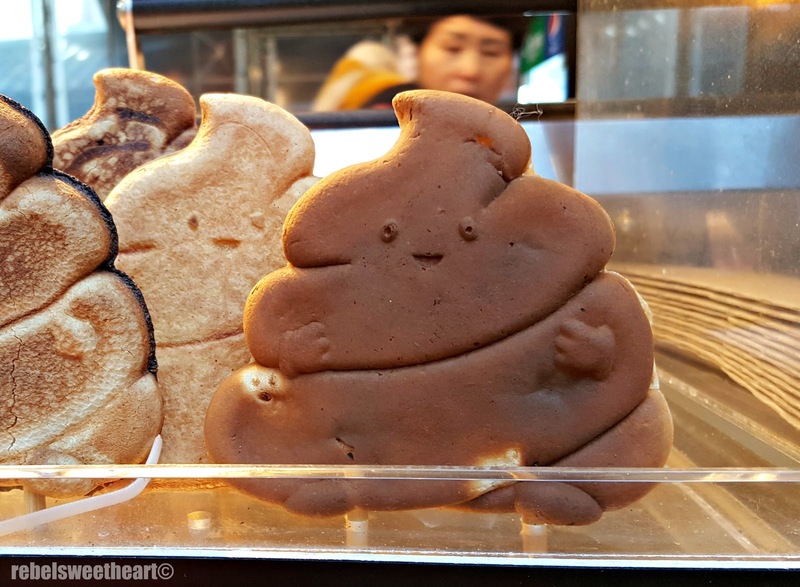 They're simply pancakes in the shape of poop. 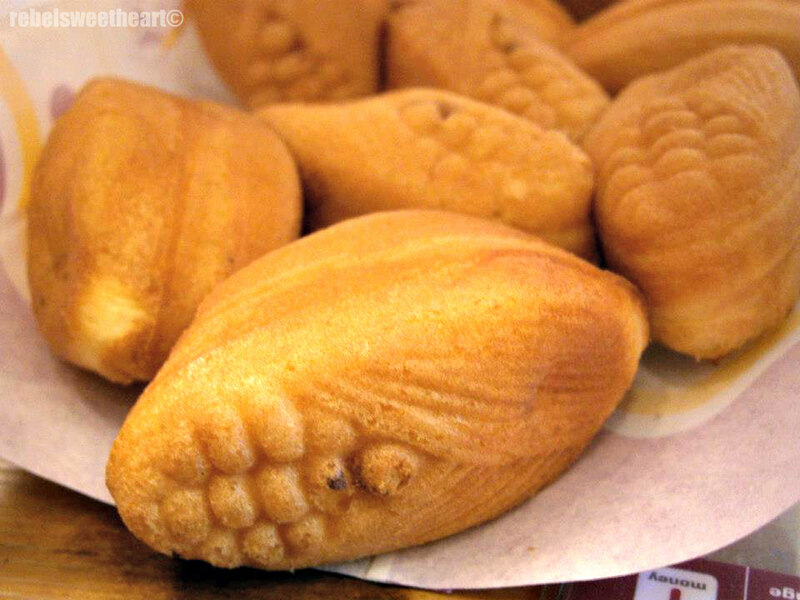 Think of it as bunggeoppang (also known as taiyaki), cooked in poop-shaped molders. 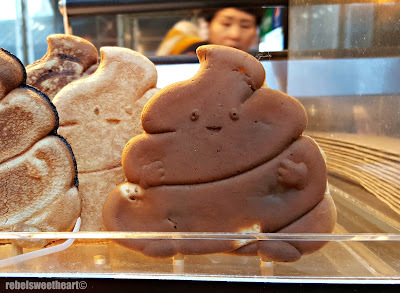 Similarly, these poop breads also come with a dollop of filling and you can choose between the traditional red bean filling or the creamy custard filling. They're edible, and yummy at that! Paired with a cup of brewed coffee or warm cocoa, they're the perfect tummy-fill as you explore Ssamziegil and the rest of Insadong. The stall is located near the entrance of Ssamziegil - you can't miss it! 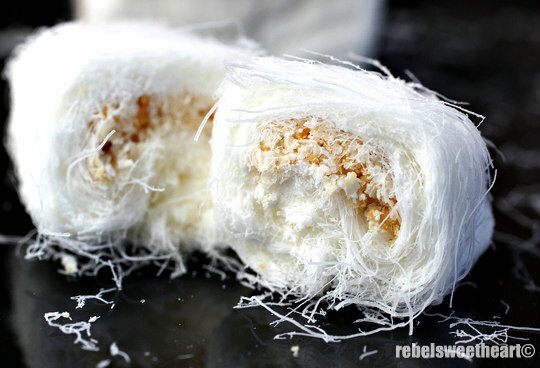 Another interesting food find which we chanced upon while at Insadong is the Dragon's Beard Candy. Also known as 'kkultarae', this traditional Korean dessert is made with honey and maltose, repeatedly spun and stretched to create 16,000 fine strands. 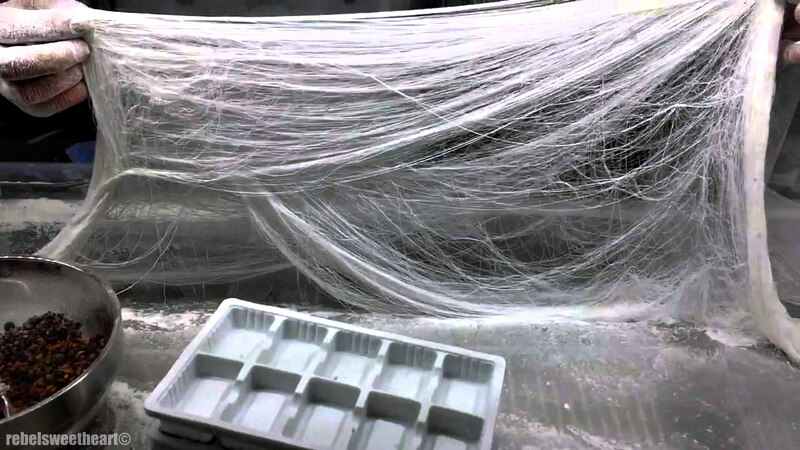 More than 16,000 strands of stretched honey. The strands are then filled with peanuts or almonds, even chocolate at times, with the finish product looking like a cocoon. Said to be a highly-priced sweet within the Korean royal court, this candy has a rich, sweet flavor and a threaded, chewy texture. There are several of these stalls lined up along the streets of Insadong, and the friendly candy-makers will definitely catch your attention. Most of them can speak in different languages, and some of them even sing and dance as they make the candy. Truly, a sight to behold! Isaac Toast, near Hyundai City Outlets in Dongdaemun. 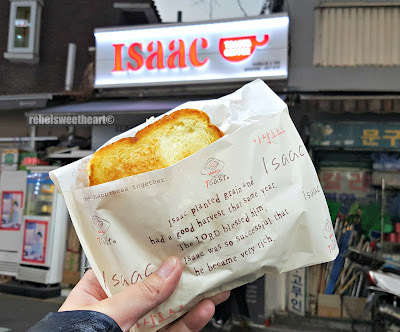 There's a hidden gem tucked along the streets of Dongdaemun and it's called Isaac Toast. Yue and I discovered the stall on our way out of Hyundai City Outlets in Dongdaemun, one of Seoul's most busiest shopping districts. 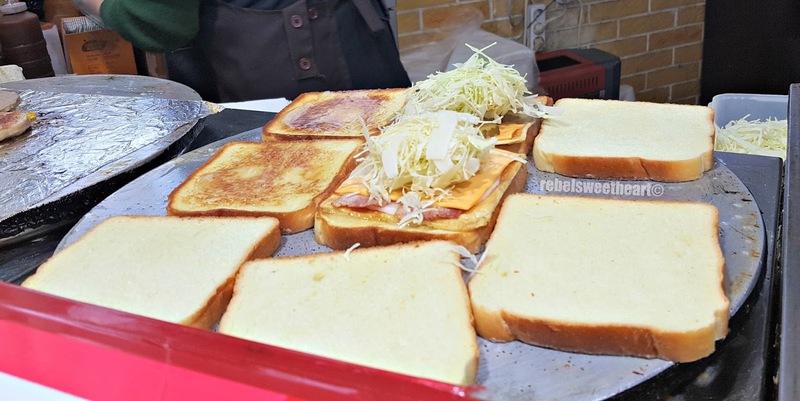 A popular sandwich chain in Korea, Isaac Toast serves freshly-grilled sandwiches, prepared and cooked right before your eyes. 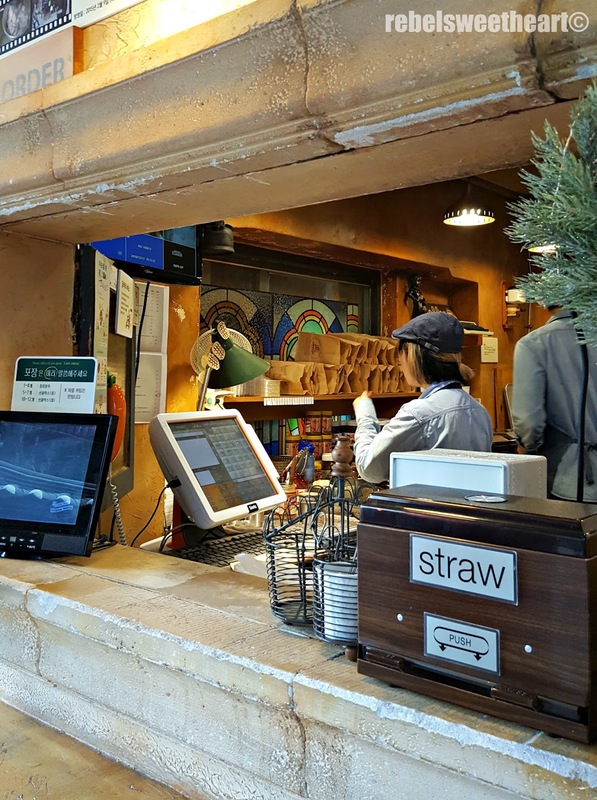 Their menu consists of a variety of flavors, with prices ranging from 2000 to 3200 won. Isaac Toast was founded in 1995 by an elderly woman who resorted to selling sandwiches to money for her sick husband. She started with a small stall outside one of Seoul's popular universities. Years later, the business changed hands but the taste and the flavors remained the same. Customers continued to patronize the brand which led to its increasing popularity and huge success. In 2003, Isaac Toast opened its doors to franchisees and now boasts of more than 500 outlets all over South Korea and even abroad. Paired with a cup of Caramel Macchiato (which they also serve, along with other coffee and tea flavors), Isaac Toast makes is truly worthy to be called the 'Breakfast of Champions' - or snack, lunch, and even dinner for that matter. KOREA is definitely on my TO VISIT list! we are about to visit Korea on November! i bookmarked this page for future reference! i will surely visit those snack shp! I love tasting the different snacks that countries offer whenever we travel! These all look so good! Especially the waffles. I'm a huge fan of breakfast food. Everything looks yummy! It's nice to try different snacks when you're out exploring a new city or place! These are definitely worth checking out. These look like grate places to visit for that snack crave esp. with children.